If you are one of the many people who love to include mushrooms in your meals, you have undoubtedly wondered how to grow mushrooms yourself. With a little patience and the right conditions you really can grow mushrooms yourself. Soon, you'll be able to enjoy varieties that you have never seen in your local grocery store. There are around 14,000 species of mushrooms in the world. While only about 250 of these varieties are actually edible, that still sounds like a huge number compared to what you are likely to find in your local grocery store. When you learn how to grow mushrooms yourself, you can experience a wider variety of culinary pleasures. Where Can I Purchase Mushroom Compost for My Garden? Mushrooms are not really plants; they are actually the fruiting part of fungi. Mushrooms do not grow from seeds as most plants do. Instead they are propagated through spores. A single, mature mushroom can produce up to 16 billion spores. These spores are collected and used to impregnate "seeds" that in turn are used as spawn by growers. Spawn is then used in the growing medium which can be sawdust, logs, straw or a number of other materials. In a few weeks, the spawn will form roots called mycelium. After a time, tiny white "pins" form in the growing medium which will eventually form the caps of the mushrooms. Mushrooms need a cool, dark, humid growing environment to grow successfully. They also need a carbon-rich medium to grow on. This is because, unlike plants, mushrooms need to consume carbon and oxygen. Rotting wood and other carbon-rich materials are ideal for mushroom because they provide the nutrients that a mushroom needs to grow. The easiest way to get started in mushroom cultivation is to purchase a kit that already had spawn inoculated compost. Usually you will wet the medium and then place it in a cool, dark location until mushrooms form. You will probably be able to find several places to purchase a mushroom growing kit. Once you feel more confident, these same places can offer you an abundance of other supplies so you can progress to other varieties and cultivation methods. Once your mushrooms have become established, you can often harvest mushrooms for years. 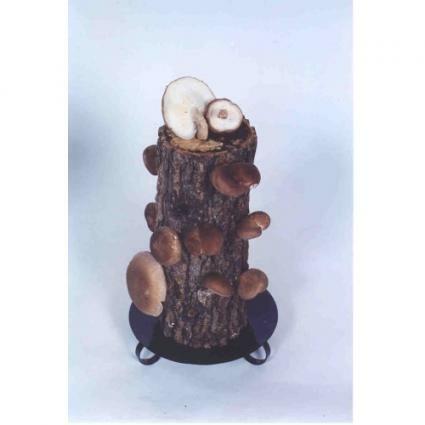 Two excellent sources for mushroom growing supplies are Mushbox.com and Fungi Perfecti. The most commonly grown mushroom is the button mushroom. This is likely the first mushroom you have ever tried. You can easily find it at any grocery store. Crimini mushrooms are also fairly common. They are grown in a way similar to button mushrooms. Brown coloring and a denser texture are what differentiate them from the white buttons. They are actually grown from a different strain of spores. Oyster mushrooms need more humidity than buttons. There are actually different types of oyster mushrooms. Why don't you try them all? Portobello are the steak of the mushroom world. Many people enjoy them by grilling and serving them like a hamburger. They are grown just like button mushrooms but have caps that can be as large as six inches in diameter. There are many more varieties that the home grower can try. Some can be grown indoors as a nice winter gardening endeavor. Others are grown outside. Once you try one you will certainly be hooked on the superior taste of fresh mushrooms. Soon you'll be looking all over your yard for another growing location. You can also find mushroom growing information by attending workshops. Fungi Perfecti offers seminars that will provide you with an abundance of in-depth information on the cultivation of several varieties of mushrooms.